Home / Analysis / Wednesday Webhits: Who’s Going To Bring Home The Gold? Washington’s blue line – led by Mike Green – are 6th in goals, 5th in assists, and 5th in points. I’m shocked – shocked! – that Alex Ovechkin is first in the NHL in points per 60 minutes of 5v5 ice team at 4.12. Only slightly less surprising are two more Capitals in the top 6, with Alex Semin at #5 (3.33 points) and Nicklas Backstrom at #6 (3.01 points). 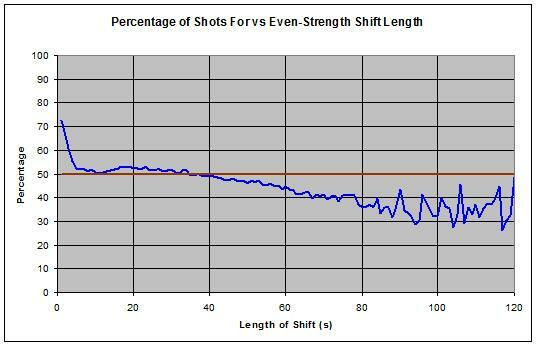 The small uptick for 0-6 seconds is from the attacking team’s defensemen jumping over the boards on an offensive rush. The defending team had better not be changing when the puck is coming into its end! At any rate, the break-even point is around 40 seconds, which is roughly the average even-strength shift length league-wide, and things fall apart after that.